Brandy Harp, a Realtor with Jon Underhill Real Estate, appreciates how each real estate transaction is unique, although she employs the same professionalism, integrity, and respect whether she is selling a $200,000 home or a $1 million home. Harp, who purchased her first home as an investment property with her husband, Richard Harp, in 2000, has learned the residential real estate business by purchasing and selling more than 50 homes personally. Harp also credits her success in real estate to the mentoring she has received from Jon Underhill. “Learning the real estate business firsthand and training alongside Jon Underhill have enabled me to pay it forward in helping my clients,” she says. 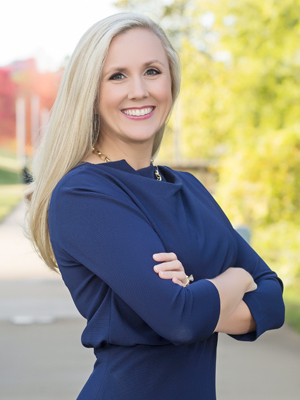 Harp’s leadership training in high-pressure environments taught her how a collaborative approach to problem solving and negotiating benefits her clients in achieving their desired results. Brandy is thankful to celebrate 16 years of marriage to Richard Harp. They have two children, Isabella Grace, who is 10 years old, and Nicholas Whitfield who is 9. She was born and raised in Arkansas. Brandy serves on the Arkansas Children’s Hospital Auxiliary and is an active member of Saint James United Methodist Church. In 2015 and 2016, Harp was recognized by the Little Rock Realtors® Association as one of the top 10 Realtors, exceeding $15 million in sales volume.